There are forays, and then there is this foray. Say what? 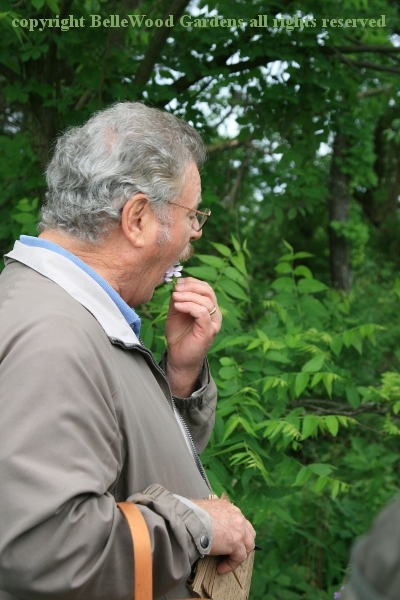 The New Jersey Mycological Association goes off on forays searching for mushrooms edible and not, multiple times every year. The early June foray is a wild foods event. 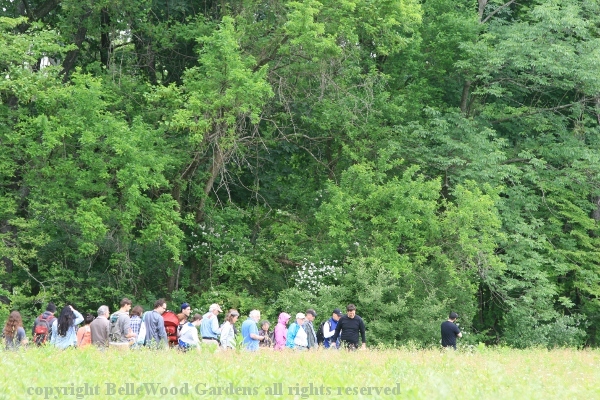 The walk, accompanied by a guide experienced with foraged wild foods, is approximately 2 hours. It is open to both members and to the general public. The potluck lunch that follows is a members only event. 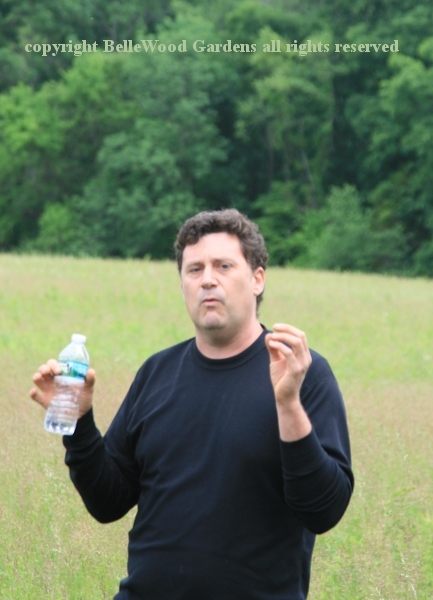 The event is always held at Deer Run Park in Hunterdon County, New Jersey. As well as ball fields there is woodland and meadows, and pavilions. Bathrooms too. This year's walk leader is Mallory O'Donnell. 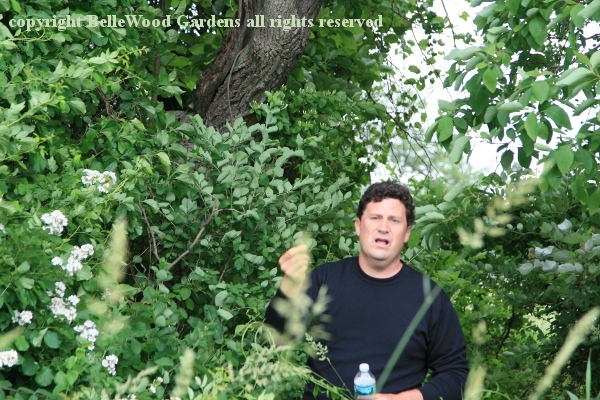 He describes himself as a subsistence forager and wild food enthusiast, working professionally in the landscaping field. Mallory gathers and consumes wild food year-round, experimenting with creative culinary applications of edible plants and mushrooms. These techniques include fermentation, brewing, infusing, vinegar-making, and creating wild spice and seasoning mixes. 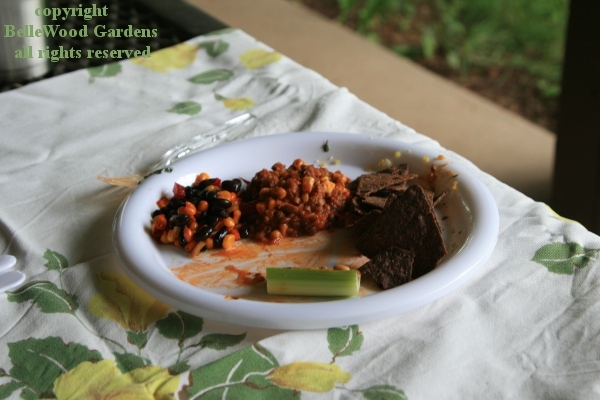 A serious focus on sustainable and ethical foraging means that he uses invasive or non-native ornamental edible plants, with selective harvesting of native seasoning plants and fruits. He posts recipes and articles on How to Cook a Weed . of a large meadow. This is a different location than previously, which is nice. Also nice - we are walking on a wide mowed path. Ticks don't like short grass. 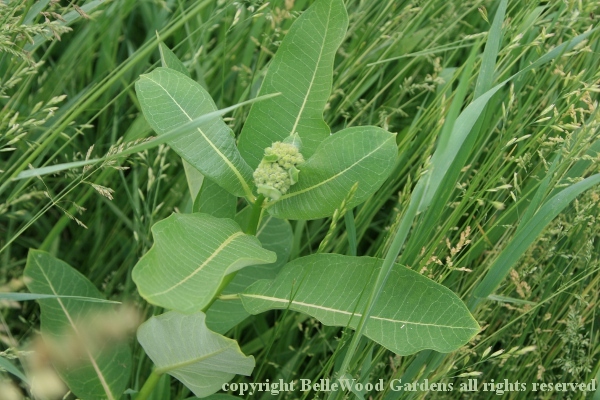 how to identify, how to prepare them, what the seed pods look like, and more. He is clearly speaking with a wide, deep knowledge of the plants and their uses. a reusable one that can easily be refilled, even here, from a water fountain. 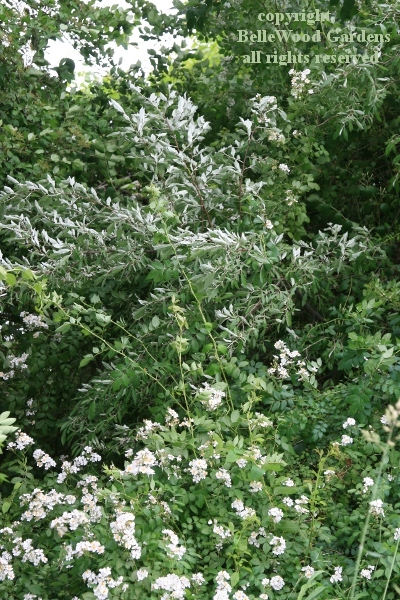 Invasive exotics: multiflora rose and autumn olive. Both, once upon a time, brought to us by the USDA as useful plants. Then they escaped from gardens. Both rose petals and rose hips are edible, though the quite small rose hips mean you must forage in quantity. The autumn olive fruits, high in several vitamins and minerals, are edible, good for making jam, a syrup, or fruit leather. 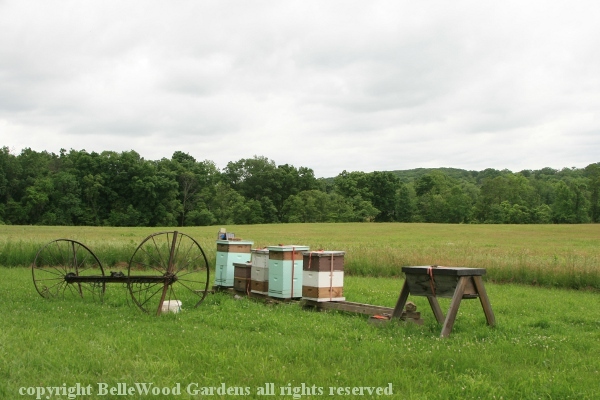 We walk past several beehives, top strapped to the supers. Very odd. Would not, I think, deter a bear. And any fool who would disturb a hive . 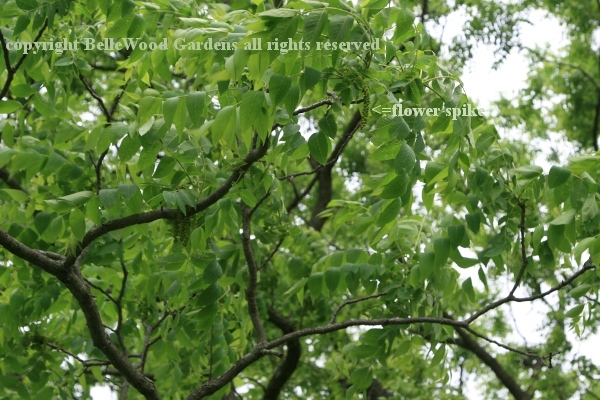 . .
Black walnut tree in flower. The nuts are delicious, if difficult to remove from the thick shell. And that is after removing the hull. Which is a substantive dye, no mordant required. Will stain hands, clothes, and oh yes, yarn. Immature green nuts, so tender that they may be pierced with a needle, are used to make noccino, red wine infused with green walnuts. Been there, done that, agree with Mallory, not impressed with the result. 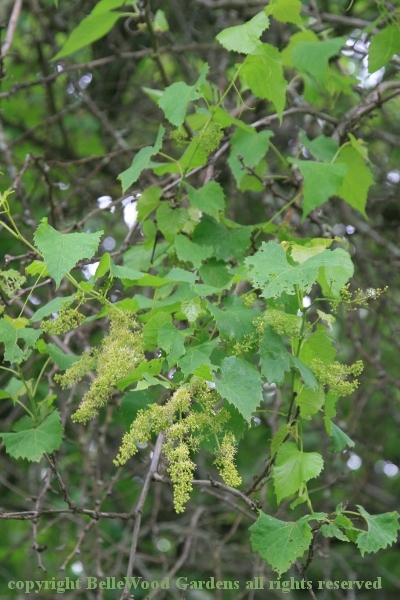 Grape vine in flower. Now this does impress me - wild grapes make a marvellous jelly, grape jam, grape butter. Grapes are high in tartaric acid so if you extract juice and promptly make jelly the little crystals will form in the jelly. Mallory said he extracts the juice in the evening, makes jelly the next day. That works, because the crystals form on the glass jar in the refrigerator. Even easier - my mother taught me this one - cook a cut up apple together with the grapes when preparing to extract the juice. The crystals won't form. Mallory points out Japanese wineberry. Later in the season the arching canes will have red, mild flavored berries. Nearby are blackcap raspberries, petals dropped and small green fruits just beginning to form. Everyone loves the summer fruits from raspberry and blackberry - people, birds, bears. We're still walking, now on the far side of the big meadow. The group is ahead of me - photographers may start up front but soon tail off to the back. I notice something very odd. Not an insect gall . . . Nina comes over for a look. She doesn't recognize it either. Someone with a knife cuts one open. It's white, and solid. A bead of white sap forms. We call Mallory back. He had not noticed it. 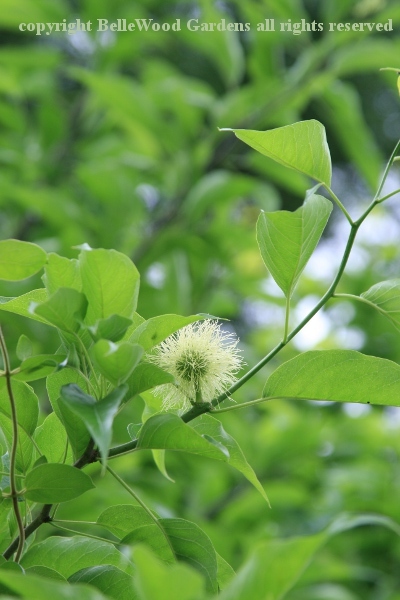 Nina crashes into the thicket and I hear her say, "It is a tree and the bark looks like Osage orange." I have never before seen anything but mature Osage orange, Maclura pomifera, fruits, those spherical green warty things that deserve the common name of monkey brains. Inedible, though I've heard that the fruits are good for repelling cockroaches. What a funny looking thing. We stop by a patch of dame's rocket, Hesperis matronalis. Mallory uses it for a good teaching moment. 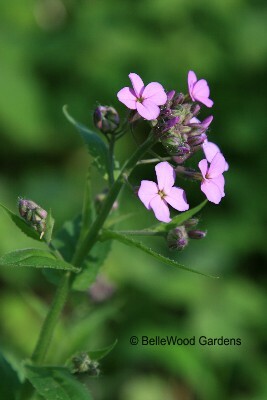 Dame's rocket is a crucifer, related to cabbage and kale and mustard. They're good to eat. Plants in the Umbelliferae, on the other hand, are dangerous. Yes, carrots are in this plant family but so is water hemlock, possibly the most poisonous plant you might find growing wild. And then there's the Solanaceae. Some are wonderful, such as peppers and potatoes, eggplant and tomatoes - but remember when tomatoes were first introduced Europeans thought they were poisonous. And others in the family are well deserving of their names, like deadly nightshade. One of our group decided to sample dame's rocket. Should have asked him what it tastes like. An area with scrappy soil, bare patches, and scruffy plants has a few Shirley poppies in bloom. Remnant, self-sown plants from seeds planted once upon a time. 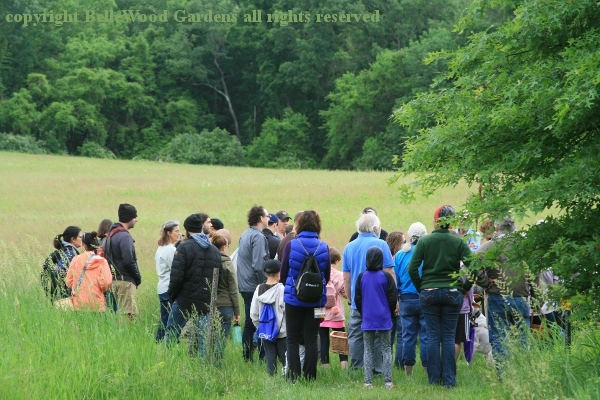 Reminds me - on Sunday, 10 June, there will be an afternoon with poppies at Wave Hill, a wonderful public garden in the Bronx. 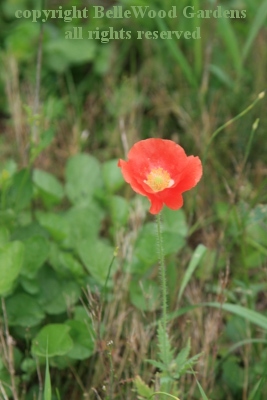 At 2:00 p.m. there will be a guided walk to see poppies in the garden. 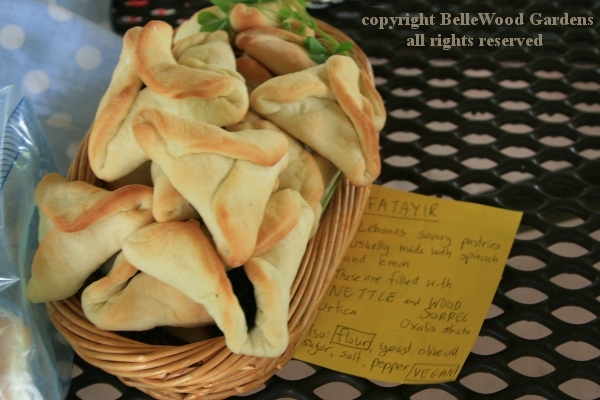 Then at 3:00 p.m., a cooking demonstration and tasting of poppy seeds in cooking and baking. non-members leave. 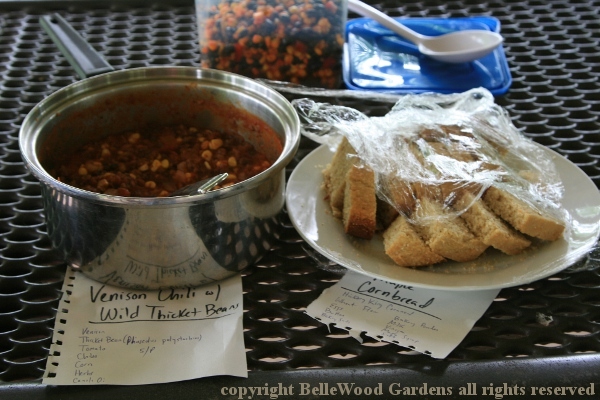 And some of us start bringing potluck food to the pavilion. black bean and corn salad with diced red onion and sweet red pepper. Mallory brought a Roman vignarola made with spring onion, feral bamboo, local asparagus, flageolets, wood nettle. cooked in white wine and black walnut infused evoo, splash of spring vinegar from 2017 (cedar, spruce, chervil), sweetfern, bee balm. That pot got emptied rather quickly. Someone brought eldeberry switchel. I put some in my glass and topped it up with cold tea for a refreshing drink. Other salads. Three wonderful breads, one with dried currants, another with porcini (the liquid from soaking the dried mushrooms was used in the dough), and a focaccia where the greens were a layer folded into the dough because otherwise they would be crispy chips on top. of ingredients, I think za'atar, ground sumac berries and thyme would be good. from paper and plastic to one setting with a tablecloth. Elegance is good.